Waterford crystal is, perhaps, the most famous Irish brand world wide (next to Guinness, of course). Originally known as "Penrose Glass," Waterford crystal was first made by the brothers George and William Penrose in 1783. The brothers knew the secret of mingling minerals and glass to create crystal like no other and their techniques are still used today. When tapped, it sings sweetly like an Irish tenor. When touched, it feels warm and soft like an Irish lass. 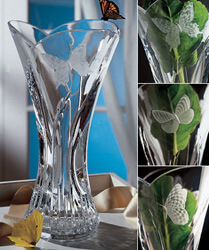 Yet Waterford Crystal possesses the strength and durability of the Celtic people, themselves. If you purchase Waterford Stemware you will find comfort in knowing the company never discontinues a pattern. This is unique in its class. We recommend buying Waterford from a reputable outlet (like Cash's of Ireland) and having it shipped to you rather then collecting it there and carrying it around the country. Sure, it's not as fragile as a heart, but it can still break.